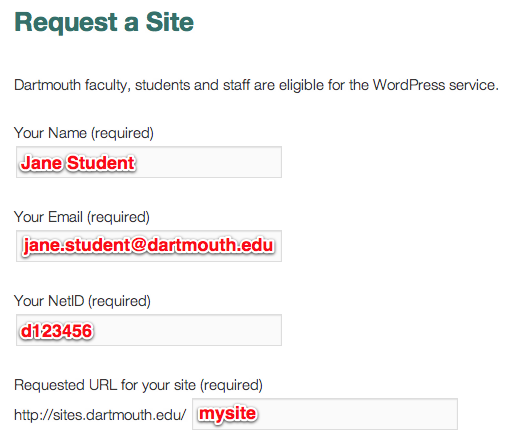 To request a website on Dartmouth WordPress, please complete this form. NetID refers to your seven character Dartmouth ID that you likely use to log into email and other College systems. Please use lowercase letters for the alphabetical characters in your NetID. Your website will have a URL similar to the structure https://sites.dartmouth.edu/site. The "sites.dartmouth.edu" portion of the URL is required, but you may choose the end ("site") portion. For example, if you would like your website to be located at the URL https://sites.dartmouth.edu/myblog, you would specify "myblog" in the requested URL field on your form. Please use lowercase letters (no uppercase letters) in the URL of your site. You will receive an email with your login information once your site is created. You will use your Dartmouth NetID and password (that you use to log into other College systems) to log into Dartmouth WordPress.